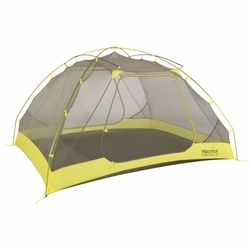 Marmot Tungsten UL 4P Tent. More space means more comfort, and this tent delivers without extra weight. The lightweight freestanding Tungsten UL 4P has an incredibly roomy sleeping area and tons of headroom thanks to zone per-bend construction that creates vertical walls. The rain shield polyester flysheet doesn't stretch and sag when wet ensuring you're comfortable and dry on the inside, while two D-shaped doors with large vestibules provide plenty of space to store everyone's gear when the rain is coming down.